For Roberto Azevêdo, director general of the World Trade Organization, an amendment to the Trade-Related Aspects of Intellectual Property Rights (TRIPS) Agreement that affects access to pharmaceuticals for developing countries remains a priority of the WTO. There is strong interest in the amended agreement from developing countries including countries from Africa, said Azevêdo. He was speaking at a news conference held at the United Nations Palais on 24 November. Health, pharmaceuticals and intellectual property rights have been controversial issues, particularly for developing countries in international trade negotiations. “There is much that we can do to make trade more inclusive, to help small and medium enterprises,” said Azevêdo. He noted also that e-commerce is an engine for greater inclusiveness and is an appropriate platform. Most of the questions focused on seeking reaction to pronouncements made by US President-elect Donald Trump during his campaign in which he denounced trade agreements such as TPP (the Trans-Pacific Partnership) and NAFTA (the North American Free Trade Agreement). Trump was said to have even commented once that the United States would consider leaving the WTO. “I haven’t had any indication from anybody that that could be the case. I think we have to be ready for a conversation,” he said, noting that he does not think the new US negotiating team has been named yet. 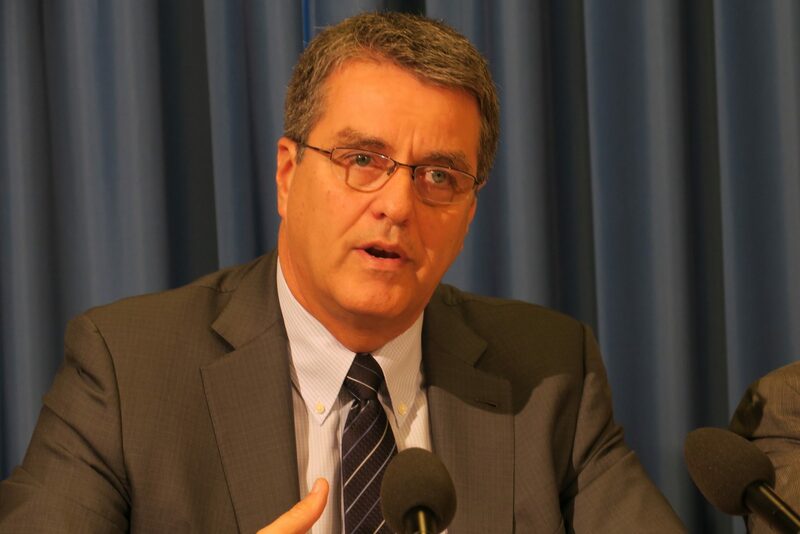 The WTO head, the former Brazilian ambassador to the WTO, has indicated that he will seek a second term, when the post of director general comes up for renewal next year. So far no other candidates have thrown their names into the ring. “We have to make the case for trade and its importance for growth,” said the WTO head. In answering questions on Trump, Azevêdo said that the WTO has to wait until it can see what the new administration in the United States really wants, as he is not in a position to react to statements made about trade agreements that could be rejected during a campaign. “I am convinced that the WTO can continue to be a very important partner of the United States and other trading partners,” in reviving global trade growth, he said. “We have to look at the details, we have to look on what has actually been done in that context, will there be negotiation about new agreements or another initiative to replace it there, will there be another trade policy that come into place seeking to advance their interests,” said Azevêdo. He explained that he has not heard opposition from the United States to trade, but only heard of people’s opposition to certain types of trade. The WTO chief also argued that the cause of job losses in many countries is due to business commitments to increased productivity which invariably lead to fewer people doing the same jobs. Azevêdo also said that migration could lead to lower wages and these are not caused by trade, because trade and migration are totally separate issues. Azevêdo was asked to comment on the protocol amending the TRIPS Agreement, which was agreed in 2005 and is intended to formalise a decision to ease poorer WTO members’ access to affordable medicines. The protocol allows exporting countries to grant compulsory licences (i.e., licences granted without the patent holder’s consent) to their generic suppliers to manufacture and export more medicines to countries that cannot manufacture the needed medicines themselves. “It is a very important agreement because it is an authorisation for developing countries that do not have the capacity to manufacture pharmaceuticals, to have affordable access to them by means of importing from third parties. And this gives certainty that this can be done without infringement of intellectual property rights. The TRIPS Agreement, which came into effect on 1 January 1995, is considered the most comprehensive multilateral agreement on intellectual property. Ambassador Eloi Laourou presents Benin’s instrument of acceptance of the 2005 protocol amending the WTO’s TRIPS Agreement to DG Azevêdo. “Benin thus aims to contribute to multilateral efforts to help developing countries with insufficient or no manufacturing capacities in the pharmaceutical sector to improve their capacity to procure medicines to treat certain diseases,” he said. Benin accepted the 2005 protocol amending the TRIPS agreement on 23 November. 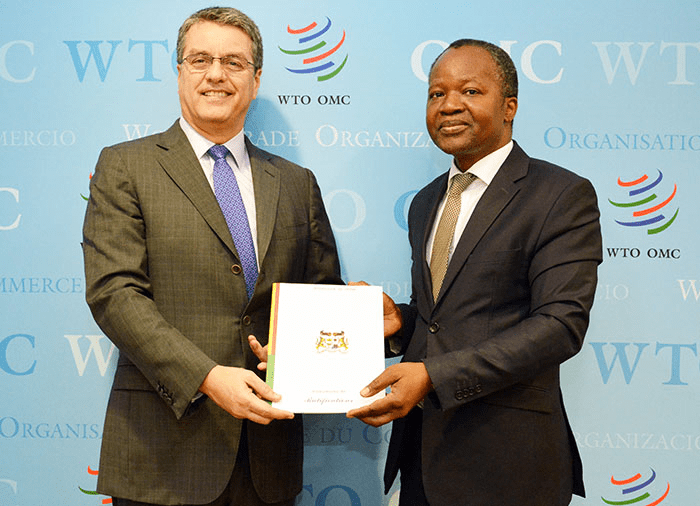 With Benin’s acceptance, close to 65 percent of WTO members have submitted their instruments of acceptance for the TRIPS protocol. WTO members on 6 December 2005 approved the first amendment to the TRIPS agreement, making permanent a decision on patents and public health originally adopted in 2003. The decision is referred to as the “paragraph 6” solution as it refers to paragraph 6 of the 2001 Declaration on TRIPS and Public Health that called on members to solve the medicines access problem as quickly as possible. It provides a waiver to a TRIPS rule that limit drugs production under compulsory licence to be predominantly for the domestic market. The amendment will be formally built into the TRIPS agreement when two-thirds of the WTO membership has accepted the change. They originally set themselves until 1 December 2007 to do this, but Azevêdo said domestic considerations had pushed it into the background as a priority. Alongside the recent meeting of the WTO TRIPS Council, a range of experts cautioned developing countries against signing this paragraph 6 amendment as they argued in fact it would further harm them rather than help (IPW, WTO/TRIPS, 14 November 2016). But developing countries seem not to be listening to the warnings. Peter Kenny may be reached at info@ip-watch.ch. "Amended TRIPS Agreement Close To Ratification, Says WTO’s Azevêdo" by Intellectual Property Watch is licensed under a Creative Commons Attribution-NonCommercial-ShareAlike 4.0 International License.